The special counsel Robert Mueller has subpoenaed Ted Malloch, a controversial academic with ties to Republican strategist Roger Stone and Brexit leader Nigel Farage, to testify in the Russia probe. Malloch said investigators questioned him about his relationship with Stone, his involvement in President Donald Trump’s campaign, and whether he visited the Ecuadorian embassy where WikiLeaks founder Julian Assange resides. 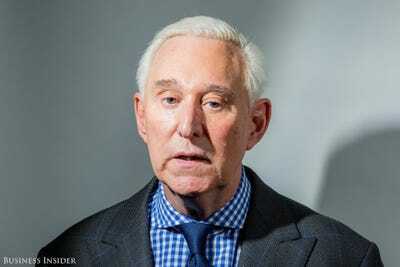 Stone said in an interview that he recalled two meetings with Malloch – one of which took place during the 2016 campaign – and that they never discussed Assange, WikiLeaks, or Russia. Fusion GPS cofounder Glenn Simpson described Malloch last year as a “Bannon Stone associate” and said he believed Malloch was a “significant figure” in the Trump-WikiLeaks connection. The FBI has subpoenaed Ted Malloch, an American academic with ties to Republican strategist Roger Stone and former UK Independence Party (UKIP) leader Nigel Farage, to testify in the Russia investigation. Malloch was detained at the Boston Logan International Airport in Massachusetts on March 27 after flying in from London, according to a statement sent to Business Insider. He said that after he was directed to a “special line for passport control,” he and his wife were escorted to a separate corridor by a TSA official and an FBI agent, where they searched his belongings. Later, he said, FBI agents separated him from his wife and took him to a secure conference room where they seized his electronic devices and interrogated him in connection with the special counsel Robert Mueller’s investigation into Russia’s interference in the 2016 US election. Malloch said investigators questioned him about his involvement in President Donald Trump’s campaign, his relationship with the longtime Republican strategist Roger Stone, and whether he had ever visited the Ecuadorian embassy where WikiLeaks founder Julian Assange resides. Malloch said he told agents he had met with Stone three times, knew nothing about WikiLeaks, and never visited the Ecuadorian embassy. He added that he had no Russia contacts. Stone is currently at the core of the controversy surrounding WikiLeaks, the radical pro-transparency organisation that published thousands of hacked emails from the Democratic National Committee and the Hillary Clinton campaign at the height of the 2016 election. The US intelligence community believes the breaches and subsequent dissemination of emails were carried out on the Kremlin’s orders. Stone said he has communicated only indirectly with Assange in the past. He is also known to have been in direct communication with WikiLeaks and the Russia-linked hacker Guccifer 2.0 during the election. Stone, who acted as an informal adviser to Trump during the campaign, attracted scrutiny when he sent out several tweets in the summer of 2016 which raised questions about whether he had prior knowledge about WikiLeaks’ plans to publish the hacked emails. He denied knowing about the document dump in advance. In an interview Friday, Stone described Malloch as a “policy wonk” who became a “self-appointed surrogate for Trump” during and after the campaign. Malloch recently wrote a book, “The Plot to Destroy Trump: How the Deep State Fabricated the Russian Dossier to Subvert the President,” which is set to be released in May. The book includes a foreword by Stone, as well as blurbs by Farage and Alex Jones, the founder of the far-right conspiracy website InfoWars. Malloch’s description of what the FBI questioned him about, as well as his subsequent phone call to Corsi, indicates agents likely questioned him about the 2016 dinner with Corsi and Stone after detaining him. Stone said his second meeting with Malloch occurred last month, following a speech Stone gave at the Oxford Union. The Republican strategist said he met Malloch and his wife after the address, but didn’t recall what they had discussed. Afterward, Skyhorse Publishing, which is publishing Malloch’s upcoming book, reached out to Stone and asked if they could transcribe his remarks during the speech and use them as a foreword for the book. Stone said he agreed, and that he was never in direct contact with Malloch about the book. Corsi first broke the news of Malloch’s FBI subpoena, telling InfoWars that a shaken Malloch had called him while he was being interviewed by agents at an FBI office in Cleveland earlier this week. A representative for Malloch said he is slated to testify before a grand jury in the Russia investigation on April 13. Malloch said that based on the advice of legal counsel, he would not comment further on his conversations with FBI agents. He said in his statement that while he willingly cooperated with investigators, he objected to the way he had been detained and questioned. Malloch is a controversial figure in American politics. He catapulted into the national spotlight amid reports last year that Trump was considering appointing him the US ambassador to the European Union. But Malloch attracted scrutiny when the Financial Times reported that he made several misleading claims in his autobiography, including that former British prime minister Margaret Thatcher had once called him a “genius,” that he was the first to coin the phrase “thought leadership,” and that he was a fellow at Oxford University. Malloch was subsequently dropped from consideration for the EU post. Nonetheless, he has remained a constant presence in the right-wing media sphere and has earned significant praise from far-right figures like Stone, Farage, Jones, Corsi. This is not the first time Malloch’s name has come up in connection to the Russia investigation. Farage spearheaded the Brexit campaign, and he and Malloch share an ideological platform. The two men have met frequently – Malloch has appeared on Farage’s radio show multiple times, and they were also spotted together in Brussels, according to The Guardian. “What kind of data?” Schiff asked. “A thumb drive,” Simpson replied.